Lotiss was born from a passion for creativity and a desire to share it with others. We decided that we wanted to offer a departure from the typical mainstream items everyone has in their home, so we set up our own brand to create made-to-measure, unique products. This has given us the opportunity to create truly exclusive designs and products that you will not see anywhere else. The kind of products that can transform an average room into a very special place to spend your time. 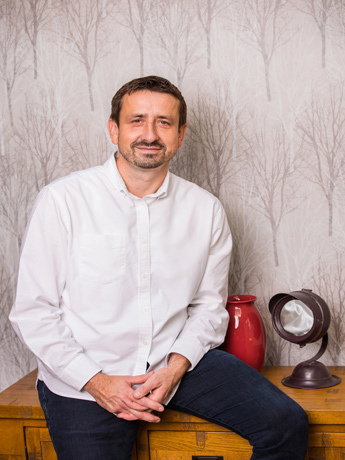 With over 9 years of professional experience working with interiors in the building industry, Andrea specialises in bespoke window dressing and soft furnishing. 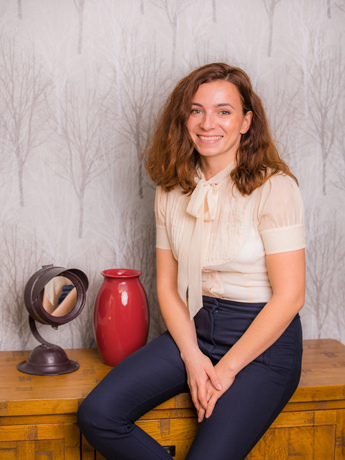 Her particular passion is interior design and she gets a real kick in helping clients to evaluate their options and decide on what’s right for them. Andrea is a real stickler for practicality, and her intuitive grasp of different people’s tastes brings a unique perspective on the service that Lotiss offers. A seasoned building professional with almost 20 years’ experience, Igor is well-versed in the intricacies of construction, especially when it comes to finding technical solutions for complex challenges. His upbeat and outgoing attitude is balanced only by a genuine concern and desire to help his clients, especially when it comes to interior design, which is where his passion lies. Both Andrea and Igor currently live in a lovely family home in a small village at the intersection of three county borders: Hampshire, Berkshire and Surrey. They love to spend time together with their 7-year old son and the family pet, a flat-coated retriever, both of whom keep them very busy! In their spare time, both Andrea and Igor are avid fans of anything to do with interior design, history, architecture, art and music, especially if it means meeting up with friends. Arrived on time, very quick and tidy and did an extremely good job, would highly recommend. Arrived in time. Were very polite. Finished work quickly and professionally. Left the place clean. Excellent work, very polite workers and job completed well within the time given and to an excellent standard, thank you, will be using you again. I have used this company before and am always really pleased with the timekeeping, courtesy, price and standard of work. I recommend them unhesitatingly. I found this company via a friend who had used them. I was very pleased. The work was done as scheduled, our property was left clean and tidy, and the workmen were polite and worked diligently until the job was completed. I highly recommend them.